Bus services 11 & 158 serve routes along Tanjong Rhu Road. Alight at “Pebble Bay” bus stop followed by a 600m walk to the venue. Bus routes 10, 11, 14, 16, 70, 70M or 196 coming from the city stop near the stadium. The same routes going towards the city are suspended. You can opt to cycle to the event site. Please kindly ensure that your bicycle is promptly racked in transition, so to not cause unnecessary obstruction to cars, pedestrians or race participants. If you are passing through portions of the bike course, please use the pedestrian paths as the closed roads are meant for race traffic. 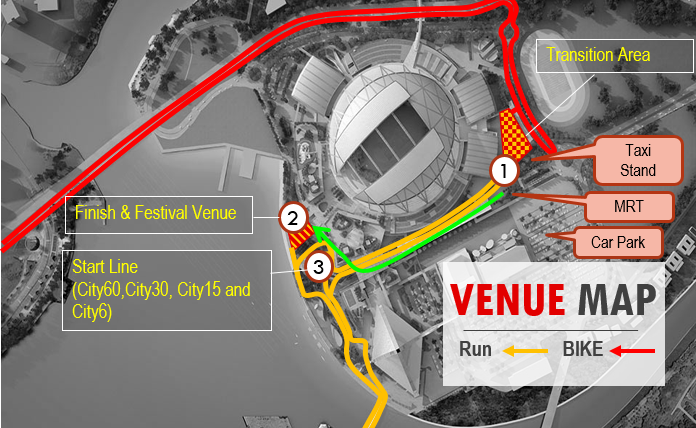 Parking is available at these locations: Kallang Leisure Park, Kallang Wave Mall, or the Singapore Indoor Stadium. Passengers are advised to alight at Kallang Wave Mall drop-off area.